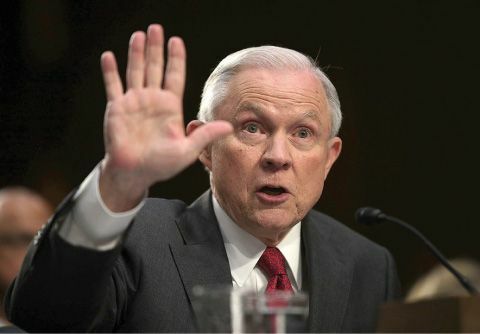 Attorney General Jeff Sessions this week heatedly denied having colluded with Russia’s attempt to influence the 2016 presidential campaign, amid reports that President Donald Trump had to be talked out of firing the special counsel now investigating the Russia scandal. In testimony before the Senate Intelligence Committee, Sessions said the insinuation that his meetings with the Russian ambassador during the campaign meant that he was cooperating with Moscow was an “appalling and detestable lie.” The former Alabama senator defended writing a memo justifying Trump’s firing of Comey, saying his recusal from campaign-related investigations “cannot interfere with my ability to oversee the Department of Justice, including the FBI.” Sessions recused himself from overseeing the Russia investigation in March after admitting to two previously undisclosed meetings with Russian ambassador to the U.S. Sergey Kislyak; Sessions testified this week he had no memory of a reported third meeting with the ambassador. To the frustration of Democratic senators, Sessions repeatedly insisted it was “inappropriate” to discuss his private conversations with the president about why Comey was fired or any other matter. Christopher Ruddy, a longtime friend of the president’s, revealed this week that Trump was considering firing Robert Mueller, the special counsel who’s taken over the Russia investigation. Trump’s aides have talked him out of that extreme step for now, The New York Times reported. But White House sources told the Times that Trump might change his mind. Sessions’ testimony was a mess of obfuscation and contradiction, said The New York Times. The attorney general insisted he couldn’t discuss his conversations with the president because of some longstanding Justice Department policy— yet “couldn’t confirm that it existed in writing or that, if it did, he had actually read it.” He claimed his recommendation to fire Comey was based on the former director’s handling of the Clinton investigation, even though he “originally praised” Comey for announcing new emails had been found 11 days before the election. Anytime he was asked a difficult question, Sessions refused to answer or said he didn’t recall. If you think Trump won’t fire Mueller, think again, said Jonathan Chait in NYMag.com. As Comey’s dismissal made clear, the president has “no intrinsic respect for political norms,” and he finds it intolerable to be under investigation. More importantly, he has found that Republicans and his water carriers on Fox News will support him no matter what he does. The president is a “creature of impulses,” and at some point he’ll find it impossible to “repress his instinct” to rid himself of the irritating Mueller.